Noted & signed Sept 30th. Thanks, Alexandra. 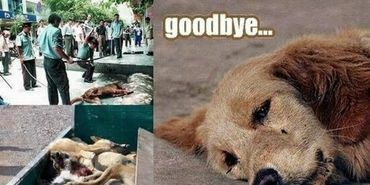 Zhangjiakou Government, please put down your butcher's knife!! Signed and shared. Thank you Alexandra. We've got 7,886 signatures, help us get to 8,000 !!!!!!!!!!!!!!!!!!!!!!!!!!! Signed. Hope one day this awful tradition will be forgotten. I missed this, signed now, but truly going to HURL! WT?????????????? ?